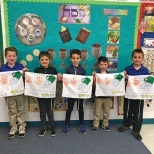 Tu B’Shevat, the Jewish new year for trees, was celebrated throughout JKHA, continuing this month’s theme of “Protecting our Planet—Treasure our Trees.” Led by the first grade, the midah of the month is derech eretz for your surroundings. 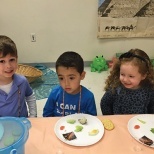 On Tu B’Shevat, early childhood and lower school celebrated the shivat haminim (seven species) of Israel at a hands-on Tu B’Shevat seder where students used their five senses to experience each food. 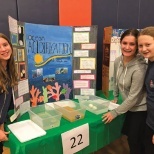 Led by the student council, middle school hosted a lively shuk for the all of JKHA to come partake of the seven minim as well. Middle school classes added interdisciplinary learning to their celebration of Tu B’Shevat and each class taught about one of the shivat haminim as it related to their discipline; including science classes discussing making grapes into raisins, math classes calculating the distance needed to grow trees and computing the costs for populating a field of trees and more. In addition to the Tu B’Shevat activities, plans for the rest of the month of Shvat include a student-driven focus on recycling, working to waste fewer resources, and collecting money to purchase trees from JNF, this month’s tzedaka. JKHA students are asked to bring in $1 this month towards purchasing trees from JNF. First grade has created a tree in the atrium that will “bloom” with leaves for each $1 that is brought in.